Click on yoke component section to customize color. I just paid for my control wheel leather wrapping – What do I do next? Upon finalizing a ship date to Aero Comfort contact us at 210-340-0177 to schedule your control wheel leather wrap. Then have your local AP or avionics shop remove the control wheels and ship them to Aero Comfort via UPS/FEDEX, or USPS. What is it that I have to send in? You need to send in the control wheel castings, center caps (logo plate), and the grip end caps. Do I need to remove any wiring and/or switches before sending my yokes in for leather wrapping? We prefer that our customers send in their wheels without switches or wiring. If you decide that you want to send them in with the wiring and electrical switches we can work around them. However they will be an additional cost associated with the switch and wiring workaround labor time. We will contact you with a cost estimate for approval. NOTE: Aero Comfort is not responsible for any electrical components or wiring connections. It is recommended that a final electrical check is done on the yokes once they are installed for functionality. This is the responsibility of the installing party. Can I send in just one yoke at a time? No. It is recommended to send both yokes at the same time in order to avoid any color variation in leather dye lots. What kind of leather does Aero Comfort use for their control wheels? Aero Comfort uses Spinneybeck aircraft grade leather which is flame-treated to pass FAR requirements for aviation use. Are the yokes stitched by hand? Yes, our control wheel leather wrapping is done completely by hand. It is a craft that our technicians have perfected and the reason why our control wheel leather wrapping is sought after in the industry. Can I buy the covers or a kit to install myself? No, our leather wrap is not a velcro or slip on cover that is easily installed. It takes quite a bit of time and skill to properly install our leather wrap. Where do I send my control wheels? How long do my control wheels take to get leather wrapped? Control wheels take 5-7 business days….but depending on our schedule and backlog we do offer an expedited 3 day service for an additional $400.00. Keep in mind that any expedited shipping (overnight, next day air) will be added to your final invoice separately. What if I decide I don’t want get the leather wrapping on my control wheels after I pay and or schedule them in? You have up to 10 business days for a full refund; up to 30 days you get a refund minus a 20% service fee. After 30 days there is no refund. How long do I have to send in my yokes? You have 365 days to get your yokes scheduled and wrapped. This allows for ease of coordinating with an annual inspection or any other maintenance. My AP cannot remove my control wheels as scheduled. Can I reschedule the leather wrap? Yes, as long as it is within the 365 day window from when you placed your order. The colors shown in the Control Wheel Customizer may vary from the actual leather. The point of the customizer is to allow you to experiment with general color placement. The colors represented can look different from one monitor to the next and the dye lots of the actual leather can vary from lot to lot. Do you send out color swatches of the leathers and threads? You can request color swatches for an additional charge to include shipping. What happens to the placards on my control wheels? The placards can be replaced with dyed placards or decals for an additional cost. Existing placards cannot be reused. If you purchase the placard kit, your placards, up to a quantity of eight will be replaced with new placards. 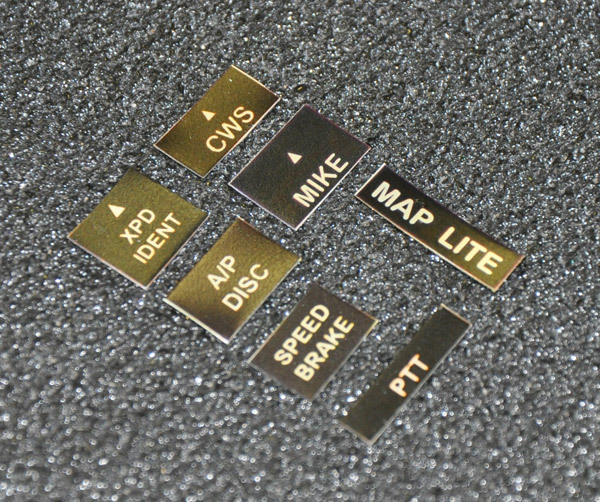 Example, Mike, XPD Ident, Map Lite, PTT, Speedbrake etc. The kit is available as an additional option at checkout. If the kit is purchased we will install them in the same locations they are currently in. What kind of stitching do you use on your control wheel leather wrap? A handmade baseball style stitch is used on all our Aero Comfort control wheels. Do I receive any paperwork for the leather used? Yes, you will receive a burn certificate for the leather(s) used on your control wheels. How is the logo on the center bezel done? The logo is silkscreened onto the bezel leather providing a nice but subtle look of the Mooney eagle logo. For Cessna and Piper Yokes an embroidery option is available. Are there any other logo styles available? If you have a custom request please let us know and we will provide an estimated cost. Do I have to make any openings on the finished control wheel leather for switches once I receive my wheels? We ship the control wheels with all openings already made and ready for final installation. This way if any openings are needed in the future for any modifications they are already made and risk of damaging leather work is avoided. Do you have an exchange program? No, if you are looking for a core to save down time – you may want to consider our expedite service. Do I get my actual yokes back? Yes, the set of yokes that you send in for leather wrapping is the exact set you will get back. There is no core swapping. What if I am missing any parts (ie. Grip caps, center bezel, map light bulbs)? Once your yokes are in house and inspected we will automatically contact you about any missing parts. We normally have them in stock. Those will be added to your order upon your approval. Are my control wheels inspected? Control wheels are visually inspected for cracks, corrosion, and or cracks. If the yokes are deemed un-wrappable we will contact you and arrange return. What if my control wheels have minimal corrosion or have peeling paint? In order for the control wheels to be wrapped the finish needs to be stripped and the yokes need to be primered for leather wrapping. All peeling paint and minimal corrosion is cleaned and the casting is primered before leather wrapping. The cost for this service is $150.00 per set. Does Aero Comfort provide a warranty on control wheel leather wrapping? Yes. Aero Comfort offers a 1 year warranty on workmanship. Do the control wheels have any padding added to them? Yes, the grips have a 1/8” inch padding installed to provide added comfort. Can I get extra padding? No, this minimizes the handle area which is not recommended. Can I opt for no padding? No, we do not recommend NOT using padding since the grip area is what takes more use on the wheel and leather will wear quicker without any padding. This change also affects our standardized templates so we do not provide the option to remove padding. I do not have any control wheel castings – but would like a set. Do you sell control wheel castings? No. We do not sell control wheel castings. What happens to my hardware on bezel and grip caps? All of the screws on the bezel and grip end caps are always replaced with new hardware. How do I protect my control wheel leather? Cleaning kits are available as an additional option at checkout. The Spinneybeck kit comes with 2- Cleaner, conditioner, and protector bottles and 1- Ink remover. NOTE: Do not use ink remover on or near the center logo as it will damage the logo finish. Yes. Aero Comfort has provided leather wrapped yokes for customers all over the globe. Press Continue to initiate the order process. I decline return shipping insurance and understand that Aero Comfort will not be liable for lost or damaged items.
" I understand that I must supply my control wheel castings at my own expense and must schedule with Aero Comfort to complete the leather wrapping service." How did you hear about Aero Comfort? How did you hear about the Control Wheel Customization Tool? What do you think about the tool and our website in general? Are you an existing customer? If so what have we done for you in the past? Would you like to join our Beechcraft mailing list? Providing services to customers worldwide.